Today following the bell, Google reported its third-quarter earnings: The company had gross revenue of $16.52 billion, revenue net of traffic acquisition costs (ex-TAC) of $13.17 billion, GAAP earnings per share of $4.09, and non-GAAP earnings per share of $6.35. Analysts had expected Google to earn $6.53 per share on a non-GAAP basis, on net ex-TAC revenue of $13.22 billion. In the sequentially preceding quarter, Google earned $6.08 in non-GAAP earnings per share, on ex-TAC revenue of $12.67 billion. 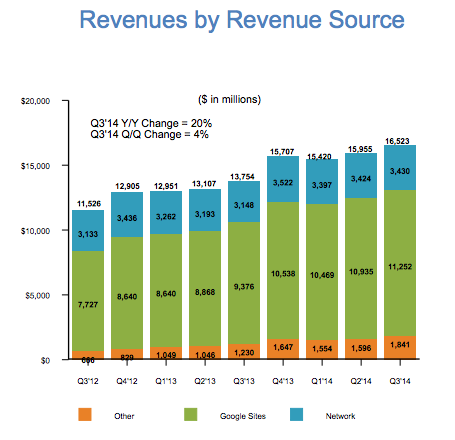 Google is working to expand its revenue base away from advertising. It is currently locked in the intertwined productivity-storage-cloud computing wars with Amazon, Microsoft, Box, Dropbox, Egnyte, Apple HighQ and others. Declining prices in that space have lowered short-term revenue potential, but that fact has done what I estimate to be a grand total of zero to lower competitive tension in the market area. The company reported net income of $3.72 billion in the period. Sites revenue: $11.25 billion. Up 20 percent from the preceding year’s quarter. Network revenue: $3.43 billion. Up 9 percent from the preceding year’s quarter. International revenue: 58 percent of revenue. Up 2 percent from the preceding year’s quarter. The company reported that its average cost-per-click fell 2 percent in the period, a weakening in a key revenue source. However, pushing back against that decline was a 17 percent year-over-year increase in ‘aggregate paid clicks.’ So, while the amount of revenue that Google managed to extract from a click went down mildly, it sold more than one-sixth more compared to the year-ago quarter. It is becoming more expensive to run Google. The company’s earnings report details its increasing cost base: “Operating expenses, other than cost of revenues, were $6.10 billion in the third quarter of 2014, or 37% of revenues, compared to $4.58 billion in the third quarter of 2013, or 33% of revenues.” Put another way: Building out new revenue streams, and investing in future products that won’t monetize for some time isn’t cheap. Google remains incredibly rich — its cash tally now sits at $62.16 billion — and profitable. However, investors were looking for a touch more growth on both the top and bottom lines. The search giant is healthy and investing. Investors perhaps need to temper their short-term expectations a touch. For Google, it’s full steam ahead. The company now employs 55,030 full-time employees. That’s up from 52,069 from the end of its sequentially preceding quarter. As a final note, Google and Microsoft now have nearly identical market caps. Something to ruminate on.